Ever since it was announced this spring, people have been wondering what will happen when Spirit’s carry-on fee takes effect. Would more airlines adopt the controversial fee? Will Spirit’s customers simply make do with personal items, which can be brought onboard for free? Well, as of today, we’ll start to learn. Spirit’s carry-on-bag fee is now in effect, meaning passengers will have to pay for all bags except whatever they can fit under the seat in front of them. 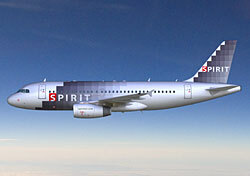 When it announced the new fees, Spirit made a big deal about how it also lowered base fares to offset the fees, and how it’s still just about the cheapest airline out there, even with the fees. This point was reiterated by CEO Ben Baldanza at a congressional hearing last month. With that in mind, I thought I’d do a few quick fare comparisons to see how Spirit’s overall costs stack up. When I did a similar comparison in April, Spirit didn’t fare so well. It wasn’t the cheapest in any of my three comparisons. I’ll use the same routes as I did then, but bump the departure out to October. I assumed travelers would bring one carry-on and one checked bag, and used Spirit’s non-$9 Fare Club fares and fees, since I’m not a member. Fares include taxes and government fees. So, for two out of three fares, Spirit was by far the more expensive. But for the third fare, Spirit undercut JetBlue by $13, even after all of Spirit’s fees were added in. Interestingly, that was the only route I checked where Spirit’s base fare was considerably cheaper than its competitors. Clearly it needs to offer dirt-cheap prices if it hopes to compete on total cost. The moral of the story, then, is a familiar cliche: No airline is always the cheapest, and you have to compare multiple airlines if you’re concerned about finding the best deal. Of course, with Spirit, there’s now a bit more math (and packing logistics) involved.